^ 1.0 1.1 1.2 Benjamin C. Hablutzel; Hans E. Rosendal; James C. Weyman; Jonathan D. Hoag. The 1997 Central Pacific Tropical Cyclone Season. Central Pacific Hurricane Center. 1997 [2016-02-08]. ^ Japan Meteorological Agency. Best Track for Western North Pacific Tropical Cyclones. 2007 [2013-04-14]. （原始内容 (TXT)存档于2013-04-14）. ^ Joint Typhoon Warning Center. Summary of Western North Pacific and North Indian Ocean Tropical Cyclones. 1999 [2011-06-07]. （原始内容存档于2011-06-07）. ^ 4.0 4.1 4.2 4.3 4.4 4.5 4.6 4.7 4.8 4.9 Joint Typhoon Warning Center. Super Typhoon Paka (05C) ATCR. 1999 [2011-06-07]. （原始内容存档于2011-06-07）. ^ 5.0 5.1 Hurricane Research Division. Eastern North Pacific Tracks File 1949–2007. National Oceanic and Atmospheric Administration. 2007 [2010-04-14]. （原始内容 (TXT)存档于2011-01-03）. ^ Annual Report on Activities of the RSMC Tokyo – Typhoon Center 2000 (PDF). Japan Meteorological Agency: 3. 2001-02 [2015-10-31]. （原始内容 (PDF)存档于2015-10-31）. ^ 7.0 7.1 7.2 7.3 7.4 7.5 Japan Meteorological Agency. 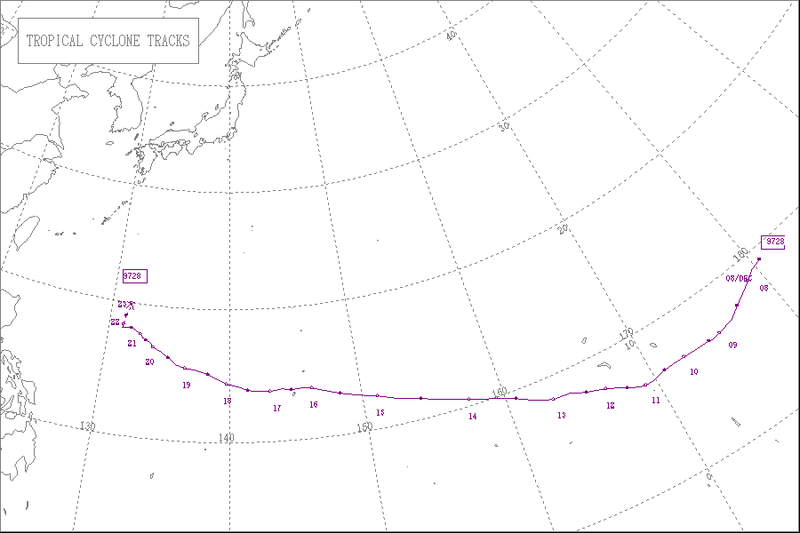 Best Track of the 1997 Pacific Typhoon Season. 1997 [2011-07-09]. （原始内容 (TXT)存档于2011-07-09）. ^ 9.0 9.1 Gary Padgett. December 1997 Monthly Tropical Cyclone Summary. 1998 [2016-02-08]. （原始内容存档于2015-09-08）. ^ 10.00 10.01 10.02 10.03 10.04 10.05 10.06 10.07 10.08 10.09 10.10 10.11 National Climatic Data Center. Event Report for Typhoon Paka. 1997-12 [2010-04-14]. （原始内容存档于2010-12-24）. ^ The United Nations Task Force on El Niño; 等. The 1997–1998 El Niño Event: A Scientific and Technical Retrospect (PDF). World Meteorological Organization. 1999 [2010-04-14]. （原始内容 (PDF)存档于2006-03-11）. ^ 12.0 12.1 12.2 Giff Johnson. Typhoon Paka hits Marshall Islands. Agence France-Presse. 1997-12-12. ^ Chris Jones. Weatherwatch. The Guardian. 1997-12-12. ^ 14.0 14.1 Sam Houston; Greg Forbes; Arthur Chiu. Super Typhoon Paka's Surface Winds Over Guam. NOAA. 1998 [2016-02-08]. （原始内容存档于2015-11-05）. ^ Agence France Presse. Cyclone Paka clocks up world record and hammers Guam. 1997-12-18. ^ 16.0 16.1 16.2 NOAA. Pacific ENSO Update – Special Bulletin. 1998 [2016-02-09]. （原始内容存档于2014-02-04）. ^ 17.0 17.1 17.2 17.3 EQE International. Typhoon Paka – December 1997 (PDF). 1998 [2016-02-10]. （原始内容 (PDF)存档于2012-09-05）. ^ BBC News. Record typhoon winds ravage Guam. 1997-12-17 [2016-02-09]. （原始内容存档于2015-04-02）. ^ Fish and Wildlife Services. Proposed Endangered Status for the Rota Bridled White-Eye (Zosterops rotensis) From the Commonwealth of the Northern Mariana Islands. Department of the Interior. 2001 [2010-04-14]. （原始内容存档于2003-11-02）. ^ Giff Johnson. Cyclone and El Nino Could Force Evacuation of Island. Agence France-Presse. 1998-03-07. ^ FEMA. Marshall Islands Severe Drought. 1998 [2012-03-15]. （原始内容存档于2012-03-15）. ^ FEMA. Guam Typhoon Paka. 1997 [2012-03-15]. （原始内容存档于2012-03-15）. ^ FEMA. Northern Mariana Islands Typhoon. 1997 [2010-04-14]. （原始内容存档于2012-03-15）. ^ FEMA. Super Typhoon Pongsona Assistance Surpasses Paka Totals. 2003 [2012-03-15]. （原始内容存档于2012-03-15）. ^ Office of the Federal Coordinator for Meteorology. Actions and Recommendations for the 61st Interdepartmental Hurricane Conference (PDF). 2007 [2016-02-09]. （原始内容 (PDF)存档于2014-11-27）.